Kerkom Brewery - Grand Cru s.n.c. di Aprile Paolo &C.
The Kerkom Brewery is 100% traditional and proud to be so. This is namely a place where real beer is still brewed. From the hops to the Bink beer, every step of the process is done manually. A beer with a story and hence a real experience ! 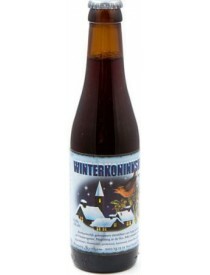 La Winterkoninkske è una belga estremamente massiccia. Ricca e molto strutturata è compagna ideale di serate fredde d’inverno.